The Missing Sync for Blackberry Released | BlackBerry Blast! Mark/Space has released the full version of their Missing Sync for Blackberry about a month after releasing the preview version. 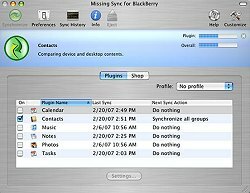 The Missing Sync for Blackberry allows Blackberry devices to connect and sync with Mac OS X applications. It will sync with the native Mac applications like Address Book, and iCal, as well as other applications like Microsoft Entourage. Blackberry Pearl or 8800 owners will be able to sync multimedia items with iPhoto and iTunes with The Missing Sync for Blackberry. The Missing Sync for Blackberry sells for $39.95 and can be downloaded from the Mark/Space web site at the link below.